The Great Fair of 1814 allowed Londonners to celebrate the end of the war with France. The highlight was a naval re-enactment of the Battle of Trafalgar on the Serpentine, complete with guns firing at 'French' ships which were slowly sunk to the sound of the national anthem. 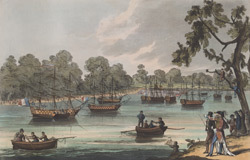 In this drawing, the fleet is at anchor.